PAULO DYBALA SCORED a hat-trick as Juventus carried their winning streak into the Champions League with a 3-0 victory over ten-man Young Boys to leave them top of Group H with six points from two games. Portuguese star Cristiano Ronaldo was suspended after his contested red card during the Italian side’s 2-0 win over Valencia in the first round of games. But Dybala ran riot in his first European game this season, volleying in his first following a Leonardo Bonucci long ball after five minutes. The Argentine doubled his account on 33 minutes when he picked up a rebound from a Blaise Matuidi shot, with Juan Cuadrado setting Dybala up for his third on 69 minutes. The Swiss played the final quarter of an hour a man down after Guinean centre-back Mohamed Ali Camara was sent off for a second yellow card. It was the Young Boys’s second defeat of the competition after they lost their opener 3-0 at home to Manchester United. Email “Paulo Dybala hat-trick sees Ronaldo-less Juventus ease past Young Boys”. 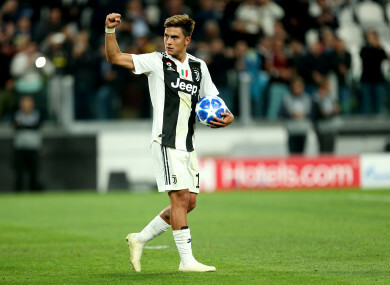 Feedback on “Paulo Dybala hat-trick sees Ronaldo-less Juventus ease past Young Boys”.